I returned to Wiley Slough in the Skagit State Wildlife Recreation Area on Fir Island to see what summer brought to these amazing wetlands. Recall that visitors can venture out into the marshes using the Spur Dike Trail. The dike is easily accessed from the Skagit Headquarters Unit managed by the Washington Department of Fish and Wildlife. Remember to bring your vehicle permit or Discover Pass. On my spring visit, I found the wetlands coming alive and greening up. A pair of Bald Eagles had occupied the nest I had spotted during the winter. In the morning calm, a Great Blue Heron hunts for breakfast in Skagit Bay. This foraging bird is probably a member of the March's Point colony nearby. You may be able to catch a glimpse of the goings-on there on the live Heron Cam. For 24 years this has been my perspective of Kiket Island across upper Skagit Bay. The island has been privately owned for decades and off-limits to visitors. This isolation allowed a pristine and unique wilderness to survive intact. Last year, it was purchased jointly by the Swinomish Tribal Community and the State of Washington. It has now become the newest venue of nearby Deception Pass State Park. To preserve the important habitats on and around the island, public access will continue to be limited. Low impact activities in small guided groups are currently allowed by reservation only. These include nature hikes, photography, bird watching and botanizing. Even around here, the weather in June is not supposed to be like this. It should be 65-70 °F/18-21 °C, plus or minus, and partly to mostly sunny. Today was more like a very warm December. It is hard to believe that the summer solstice is just 2 days away. Notice that the air temperature and dew point are very close and the relative humidity is nearing 100%. Fog forms when the dew point is equal to or almost equal to the air temperature. At the time of the photo there was a nearly imperceptible rain falling in typical Northwest fashion. It was more like a mist. For me, this is perfect gardening weather. A person can work outdoors, and for some reason, stay completely dry. In this weather, you can dig up plants and not worry about the roots getting fried in the sun. That's exactly how I spent the afternoon. On a typical, overcast June day, a bit of sun makes it through the cloud cover to light up Kiket Island in Skagit Bay. I consider it part of my front yard. 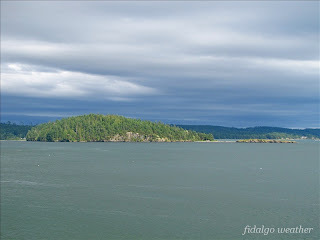 Technically, it is a peninsula, connected to Fidalgo Island by a tombolo. The smaller Flagstaff Island to the right is connected to Kiket by another tombolo. In 1969, Seattle City Light and Snohomish County PUD planned to build a nuclear power plant on the island. Yikes! Fortunately, that plan was abandoned due to public outrage. Last summer, it was acquired jointly by the State and the Swinomish Tribal Community and it will now become a part of Deception Pass State Park. Anticipated access will be by foot and non-motorized boats only. Low impact recreational activities will include bird watching, beach walking and marked nature trails. I can't wait. Until now, it has been privately owned and basically off-limits. Being undisturbed for more than 100 years allowed a unique, natural Puget Sound habitat to develop. In the haze of an overcast June day, the photo shows a view of South Fidalgo Island looking southeast down Skagit Bay. You might recognize Kiket, Skagit and Hope Islands which have been featured here a number of times. The far landmass on the right is Whidbey Island across Deception Pass from Fidalgo. In the center of the photo is Lake Campbell. The view provides an illustration of land first built by vulcanism, then carved by glaciers. We will see more of that later. There is a Northwest weather lesson here as well. Cliff Mass, Professor of Atmospheric Sciences at the University of Washington explains why we suffer from "low clouds." It's basically caused by moist marine air pushed in off the Pacific. For many of us, this misty overcast is what sometimes creates the special ambience of the region.